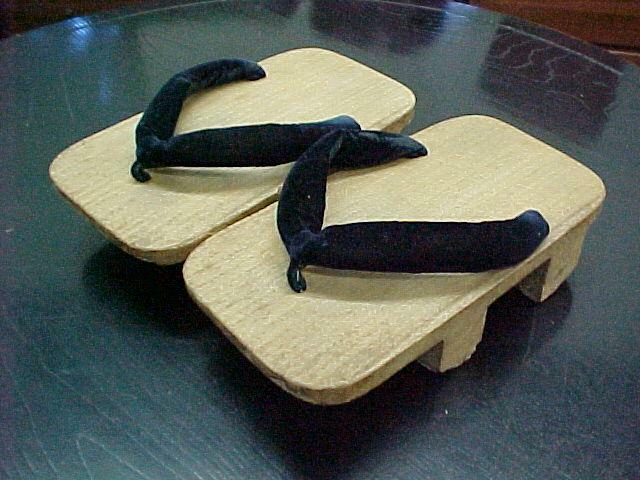 A normal pair of Getas, with a square base (台), two teeth (歯), and black hanao (鼻緒). 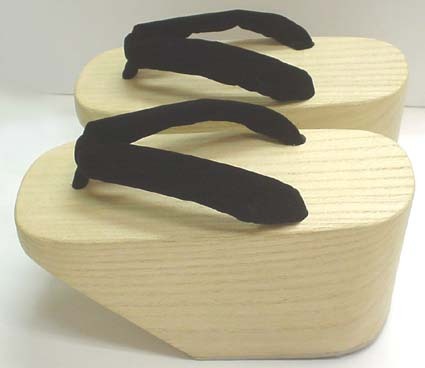 Geta (下駄, lit “horse under (your feet)”) is a pair of wooden “clogs”/”sandals”. They are basically a wooden base (台, “dai”), with “teeth” (歯, “ha”) underneath, and cloth or rope or string on top called the “hanao” (鼻緒) to hold your foot in. The base can be shaped in different ways, with slender and oval being a very feminine design, and wide and square being very manly. And then you have all kinds of varieties in-between. 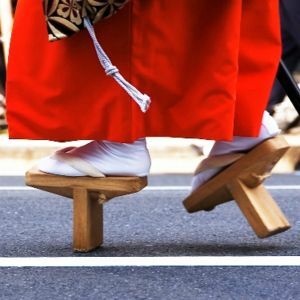 The reason for the design of the Geta is that historically, when you are wearing a kimono or yukata that you might have payed a lot of money for, you don’t want it to be dragged in the mud and dust. To get away from that, wooden sandals were made, with tall “teeth” underneath. Some merchants had even taller “teeth” on their Getas, to get their feet away from seafood scraps on the floor. There are Getas with only one long tooth underneath, called “Tengu Geta”. Tengu are mythical creatures of Japanese folklore, and they were often pictured with this kind of single-toothed Getas. The Okubo that the Maikos use. Another variation of the Getas, are the “okobo” (おこぼ). These don’t have the teeth underneath, but instead they are just one solid block of wood. The “okobo” are worn by Maiko’s, or apprentice Geishas, and the “hanao” is coloured to reflect the progress of the Maiko. Red symbolises new Maikos, and yellow show that the Maiko is soon about to become a Geisha. ← Study at Cosmos Tokyo!